No that doesn’t mean we’re going out to eat tonight … my husband is in the kitchen whipping up his famous chili! While it may only be famous in this house it is pretty yummy and I’m sure it could win an award. Beans and meat make a chili, please don’t argue with that. If it’s only meat then it may as well be spaghetti sauce; if it’s only beans then it’s a soup. GROSS. I just love that I don’t have to lift a finger for today’s dinner. What a blessing 🙂 As I type this he is wandering around the kitchen looking for things … so I’ll just direct from the couch as I sip my morning coffee. Today he picks up a flight so it’s a slow cooker dinner since we don’t know when he’ll be called in to work. 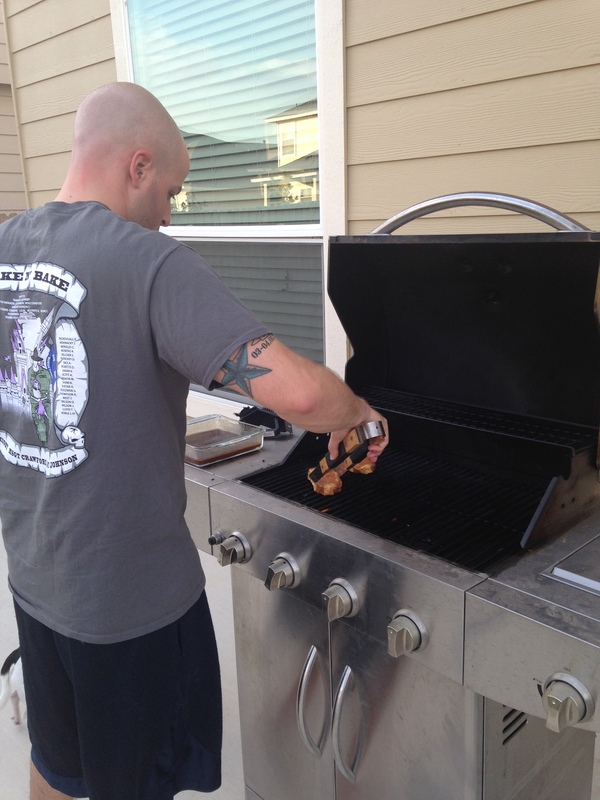 As for the last week, he got to grill a few more times before going back to his hectic schedule. 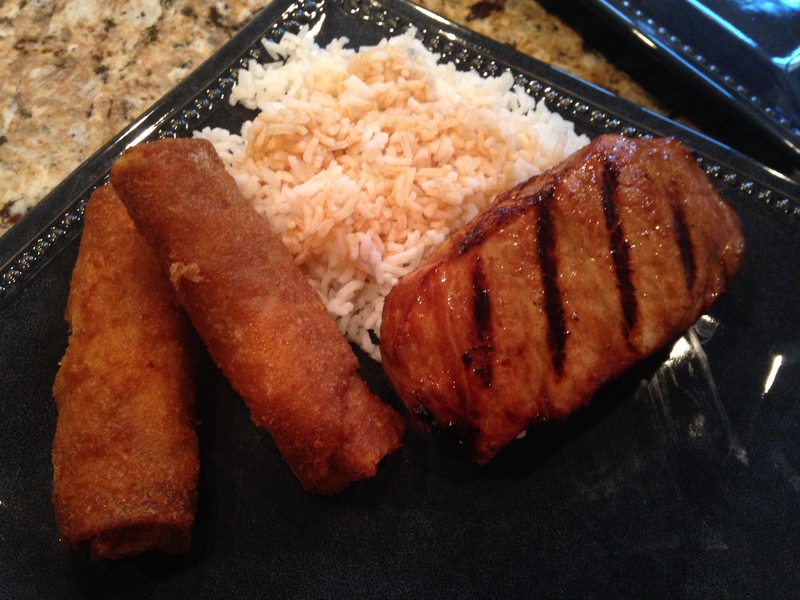 Teriyaki pork chops, rice, and egg rolls … I decided to make my own marinade to control the ingredients and boy am I glad that I did! The recipe called for 3/4 cup of sugar which surprised me and after finding a few other recipes I saw they all called for sugar. Of course we don’t use real sugar so I did a quick look on my Stevia conversion chart: 1 cup of sugar = 1 tsp of Stevia. HOLY COW! It’s such a drastic decrease. Do yourself a favor and make the switch (if you can eat Stevia) – stop consuming so much sugar – GROSS! 1 cup soy sauce, 1 cup water, just under 1 tsp Stevia, 1/4 cup Worcestershire sauce, 3 tbsp white vinegar, 3 tsp onion powder, 2 tsp garlic powder, just under 1 tsp ginger (I used powder, it called for fresh) … mix and pour over chops, let marinate for at least 30 minutes – I let them sit for maybe 5 hours. Easy sides: 5 minute white rice, I put a few dashes of soy sauce on it and frozen egg rolls. How easy is that?! It was so good and even better since the chops were grilled. YUM! 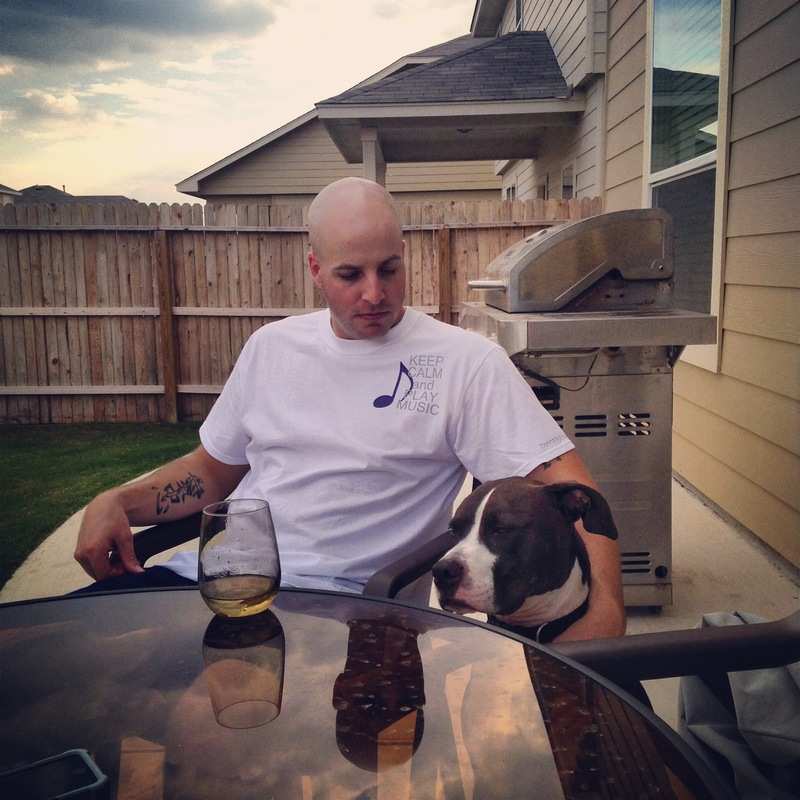 Not a grill night … just enjoying a glass of wine after a crazy day. Of course McLane had to be in the picture. These nights about about to be a rarity with my husband’s leadership class ending however that will make them even more special. 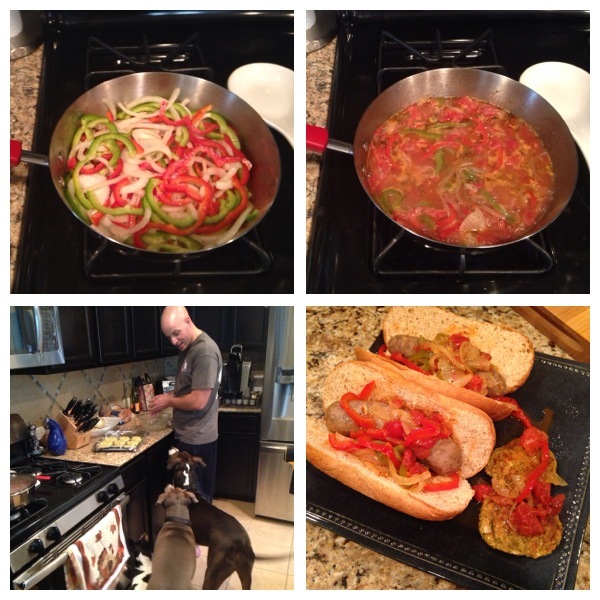 I loosely followed this recipe by Giada for sausage and peppers … I think the marsala wine made the difference. It’s a keeper! My husband helped make the side, squash and zucchini cakes (baked not fried, thank you Paula…). DO NOT USE a ton of salt, parmesean cheese is salty enough. We dipped the caked in the juice left behind from the hoagies, so good! 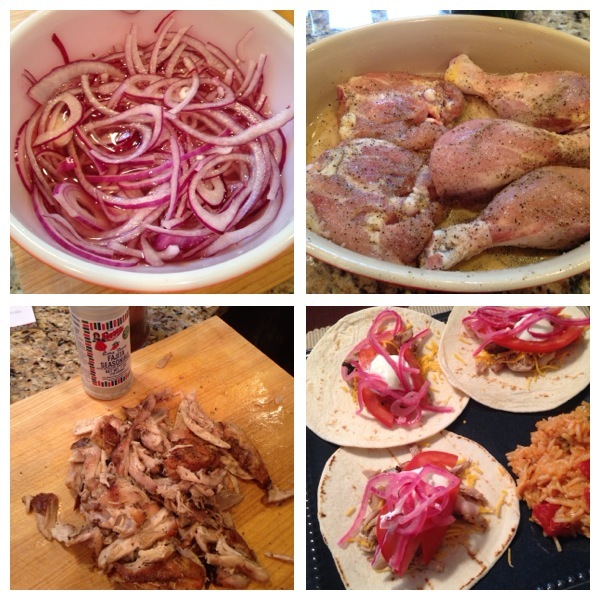 The intended dinner was to be fajitas but that idea quickly faded when the peppers and avocado had gone bad 😦 So when life hands you chicken and onions … you make tacos! My husband asked for pickled onions which is super easy and added flavor to the chicken because other fajita seasoning, I had nothing, lol! I used leftover chicken pieces and let them sit (seasoned) for the day, bake and it’s done. As always, Mexican rice as a yummy side. I’m always looking for new pasta dishes and found this one on Pinterest, of course mine turned out nothing like the blog however it was pretty good. Yes it looks like a pile of poo-poo but I’m a home cook and who really has time for pretty presentations? 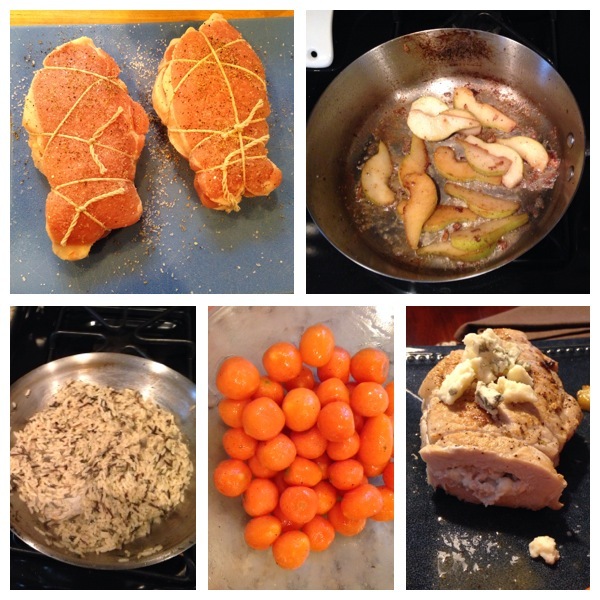 Another popular dinner, pork chops – this time stuffed with blue cheese and topped with pears. I couldn’t find thick cut chops at the store so picked up butterflied chops, put a spoonful of cheese in the center, and tied the chops shut. Easy. The pears go in after to soak up all of the juices from the meat. Buy a steam bag of veggies and dinner is complete. 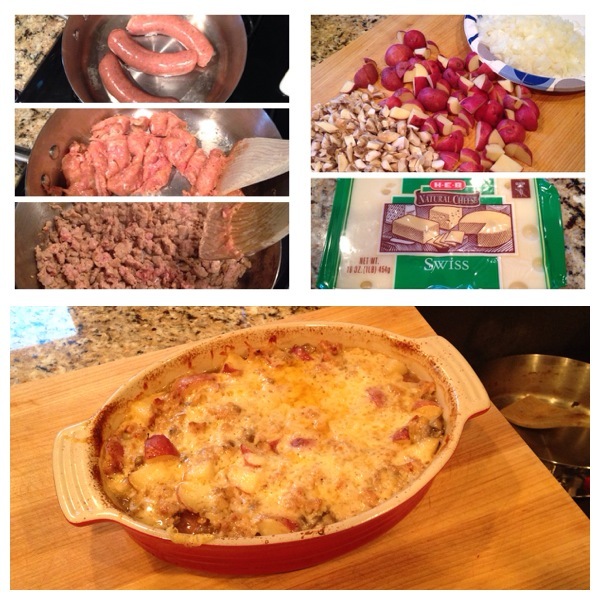 A super simple “gratin” also known as a casserole, lol. Mushrooms, potatoes, turkey sausage, and swiss cheese. This was a great diabetic friendly dish since there was no sauce (which is where most the “bad stuff” hides in a recipe). Mushrooms contain so much moisture that when cooked down and all of the seasonings have time to mix it flavors the entire dish. Last but not least, mozzarella stuffed meatballs! There’s no recipe for this … it’s pretty basic. Italian seasoned ground turkey, I added bread crumbs and an egg. 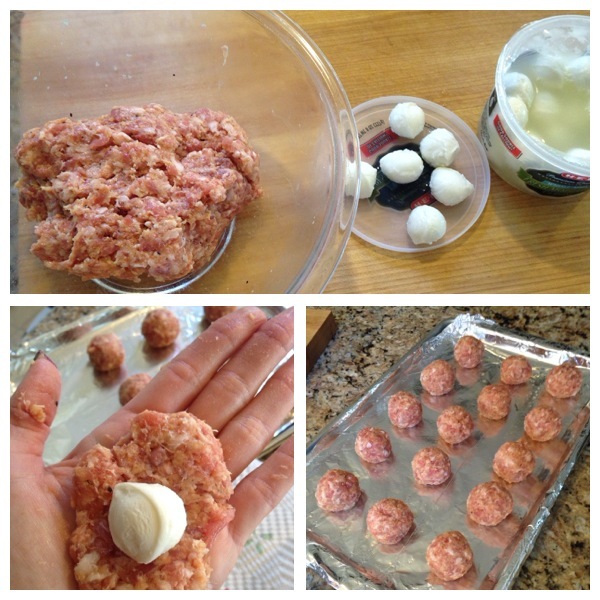 Portion out a sch-medium meatball, flatten it, place a DRIED OFF moz ball in the center, and roll up! Bake at 400 for about 12 minutes (while the pasta boils/cooks) and dinner is ready. 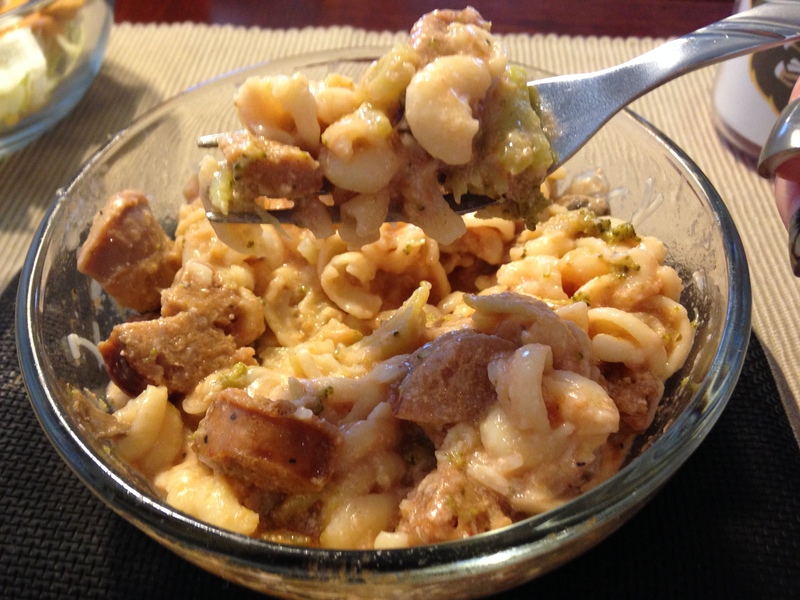 So in the time that I wrote this post my husband got dinner ready and in the slow cooker. The house smells amazing and I can’t wait for some yummy chili. Sorry folks, he doesn’t follow a recipe … honestly! He tosses stuff in the slow cooker and it always comes out amazing. It’s a bit different each time and I think that’s what I like most about it. You never know just how yummy it will be, 5pm can’t come soon enough! « Trick or Treat, gimmie something good to eat!